Wow, that about sums up this model. I had seen it as Adam was working on it, and the finished product certainly doesn't disappoint. Combining the Rotigus bits from the Great Unclean One with the Glottkin model was a genius move, and I think Adam was the first to do it. At the very least he was the first person I saw doing it. Since then many people have followed suit, and I admit, I'm tempted to as well. The pieced fit in pretty perfectly, and by just looking at this model you would think it was just some simple bit swaps, but there is actually a lot of sculpting work in this too. The left arm on the Glottkin is just a tentacle, so he had to rework it enough so it looked right with the hand, as well as his feet and his back. Even the movement in the Rotigus bits flows perfectly with the stride of the model. I can just imagine him slowly striding forward, towering over the other Great Unclean Ones. It's truly a model fit for a Greater Demon of his stature. I really love all of the Nurglings he has scattered around as well. The one lounging on his back is great, but my favorite has to be the one doing the backstroke in the slime on the base. That's a genius use of that pose and one I wouldn't have thought of. Not only is the conversion flawless, but the painting is amazing as well. The colors are very saturated, making the model really pop and stand out. 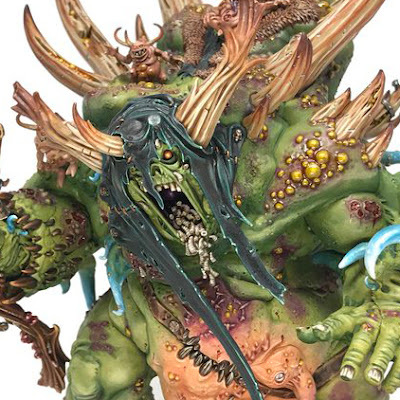 I prefer this look to the more drab schemes we see with Nurgle a lot. The skin is a wonderful shade of green, and contrasting it with the fleshier colors of his belly and the Nurglings works wonderfully. 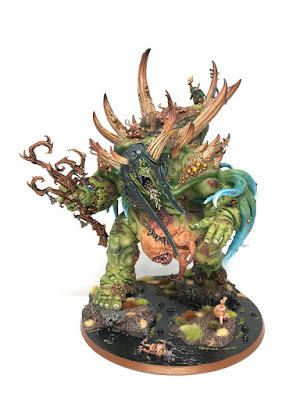 I also really like how the model is almost duotone, with the skin, hood, and tentacles all having a green tint to them, while the fleshier bits, the horns, and the wood, all have a warm brown feel. I think the horns are one of my favorite bits with the painting. They're so warm and the blending from the bone to the brown is very smooth. The base is a great final piece for the model, with tons of interest, but never distracting from the model. The dark slime frames the lighter green of the skin perfectly and also allows the little bits of ground to really pop. I think this model is pretty much perfect and will probably be what all other Rotigus minis are compared to in terms of quality going forward. Be sure to follow Adam on Twitter for even more of his amazing paint jobs!